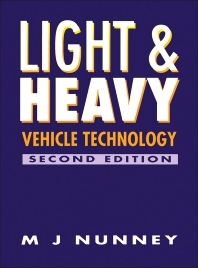 Light and Heavy Vehicle Technology, Second Edition deals with the theory and practice of vehicle maintenance, procedure, and diagnosis of vehicle trouble, including technological advances such as four-wheel drive, four-wheel steering, and anti-lock brakes. The book reviews the reciprocating piston petrol engine, the diesel engine, the combustion chambers, and the different means of combustion processes. To counter friction, heat and wear, lubrication to the different moving parts is important. To counter excessive heat which can cause breakdown of lubricating oil films and materials such as gaskets, O-rings, the engine is designed with a cooling system that uses air, water, or engine coolants. Petrol engines use the carburation or injection type of fuel delivery; diesel engines use a high pressure system of fuel injection owing to the higher pressures existing in the diesel combustion chamber. The text explains the operation of the other parts of the vehicle including the ignition and starter system, emission controls, layshaft gearboxes, drive lines, and suspension systems. Heavy vehicles need highly efficient air brakes to stop them compared to the hydraulic brake systems used in smaller and lighter vehicles. The book is suitable for mechanical engineers, engine designers, students, and instructors in mechanical and automotive engineering.